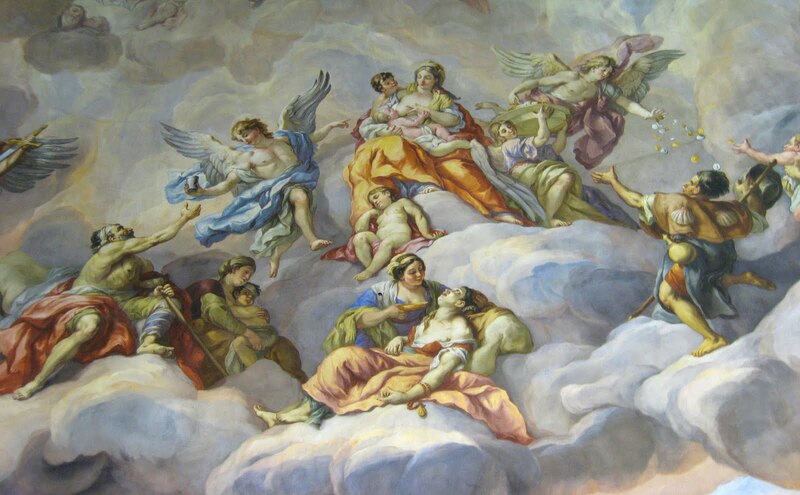 Using a rather scary glass elevator you can look at the ceiling frescoes up close. 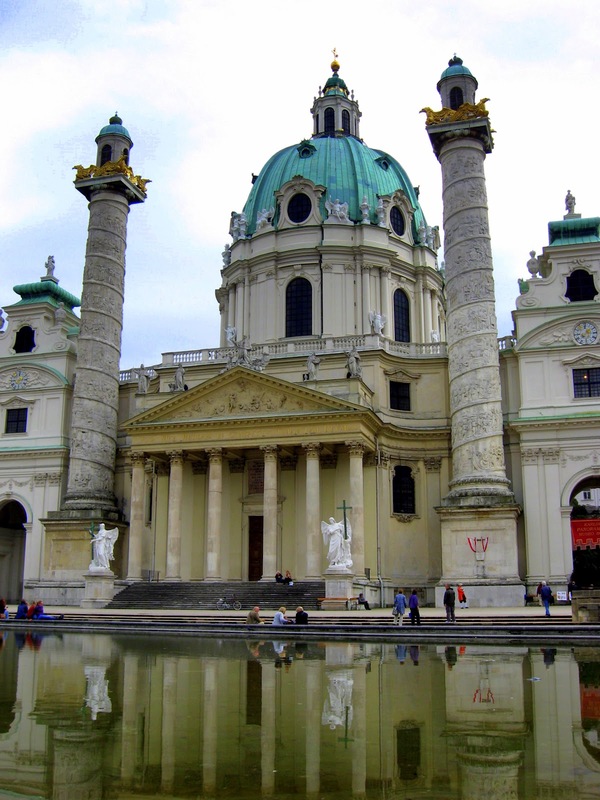 The baroque Karlskirche (St. Charles's Church) in Vienna was build between 1713 en 1736 to commemorate the end of a large plague epidemic. The height of the dome is 70 meter, and the two flanking columns are based on Trajan's Column in Rome. 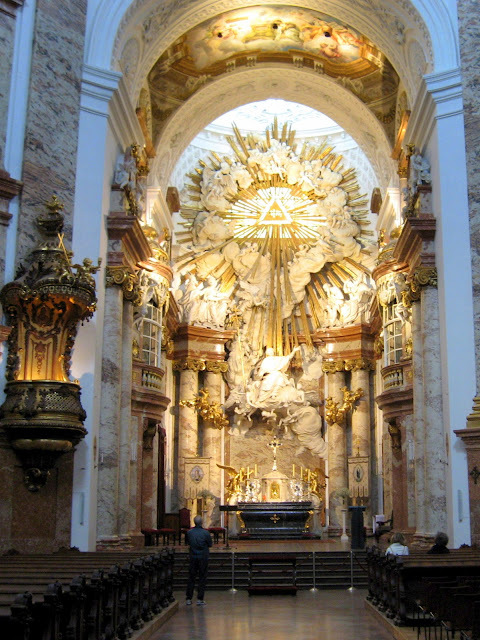 The golden triangle high above the altar shows the tetragrammaton, or YHWH (Yahweh), the name of God in the Hebrew bible. It means something like 'I am' or 'To be' or 'He who creates'. You took this theme to the other idea, and these photos are just lovely! Are these from one of your fascinating trips? I am a little curious about the eighteenth century man at the base of the pillar on the right. He seems oddly in place with everyone else looking out of place. Yes, I shot these pics myself. I must admit I hadn't notice that man (a wannabe Mozart?) before. It’s a lovely building. I was in Vienna as a teenager, but I don’t remember being inside the church. I have a slide that I took, but it is terribly faded now and there are far better representations on the internet. I perfectly remembed about this magnificent Church, very close to the Opera. Vienna in my opinion had been the largest Catholic city, in Europe, where Hebrews could live in better harmony with Christians down the centuries. hahaha they have a wannabe navy. BTW I love Vienna, one of the top cities I have visited so far.